Let customers know you're open in day or night. 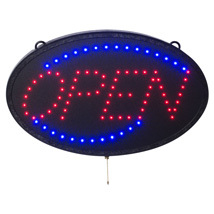 This LED Open Sign is visible in bright days or dark nights. Radiant LED light in red & blue colors offer 3 types of light patterns: chasing, flashing or constant on. Easy to operate with On/Off switch or pull-string switch. Lightweight, easy to install and plugs into any 110v outlet. Includes a power adapter, extension cord for pull string, and 2 hanging chain in 27.5 inch length each.